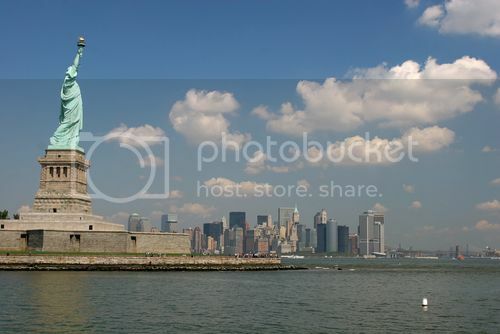 US landmarks such as the statue of Liberty and the Grand Canyon are certainly some of the most visited in North America and they’re popularly known around the world, but what about Canada? 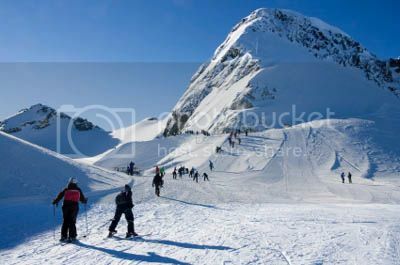 The mountains of Whistler and Blackcomb Peak are unarguably, two of the most iconic landmarks in Canada and they’re home to the Whistler Blackcomb ski resort, which is one of the most famous skiing destinations in the world. Both the summits of these two mountains are over 7,000ft high and have skiable verticals of over 5,000ft , which make Whistler-Blackcomb a dream place for skiers and snowboarders alike. Mind you, skiing isn’t the only thing you can do in Whistler-Blackcomb. You can do other fun outdoor pursuits such as wildlife watching onboard the gondola, hiking, biking, zip-line tours, and climbing. Also, if you’re a serious biker you’ll love the cool bike park (Whistler Mountain Bike Park), which has dirt roads and trails to suit all riding levels. The CN Tower is one of the most popular tourist attractions in southern Ontario and it’s no doubt, one of the most iconic national landmarks in Canada. CN Tower’s popularity isn’t surprising since it’s currently the third tallest tower in the world. The CN Tower is now even more famous because of the introduction of the edgewalk experience, which allows you to walk freely around the top of the tower. Anyways, the CN Tower has always been a fantastic attraction to visit in Canada, though the latest addition of edgewalk really gives the CN Tower the edge (pun intended) over the other towers around the world! 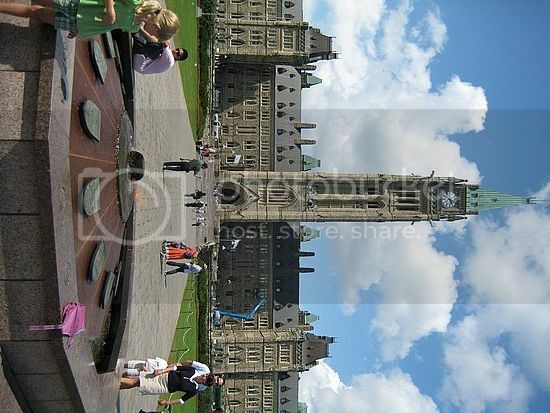 Parliament Hill is another famous Canadian landmark known across the world mainly because it looks eerily similar to the Palace of Westminster in London England. You can’t help but notice the striking similarities between the Big Ben and the Peace Tower, isn't? Still, the Hill is one of the most beloved symbols in Canada and a world-class architectural wonder with beautiful designs and stunning grounds. The cool thing about Parliament Hill is walking around the gardens and taking the guided tour of the main building, which is worth the admission fee. By the way, from Peace Tower you can get very dramatic views from its top so, don't miss it! Banff Springs Hotel is one of the oldest buildings in Canada being built in the late 1800’s and it’s a famous landmark in Canada because of its beautiful construction right in the heart of the Canadian Rockies. The Banff Springs Hotel is also famous for drawing celebrities and royalty alike who stay at the hotel for vacation. 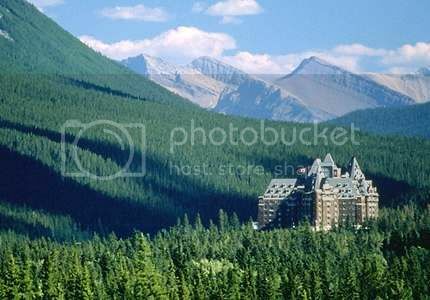 However, another reason Banff Springs Hotel is very famous for in Canada is because it's said to be haunted by the ghosts and spirits. Whether this is true or not, you'll be the judge of that if you're staying there...one thing that is certain it's that you can’t deny the hotel's breathtaking panoramas of the Rockies. Famous Canadian landmarks don’t come more spectacular than the West Edmonton Mall (WEM) in Alberta. 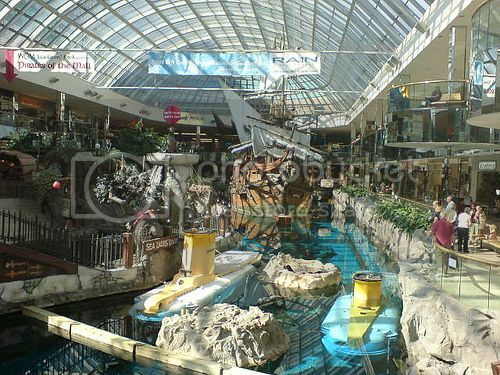 If you thought Mall of America (MOA) in Bloomington was huge, wait until you step inside West Edmonton Mall. The WEM is humongous and the attractions inside it are equally awesome, which include a 5 acre waterpark, a twenty-ride amusement park, a hockey size ice-skating rink, a sea lion cove, and an 18-hole miniature golf course to name a few. 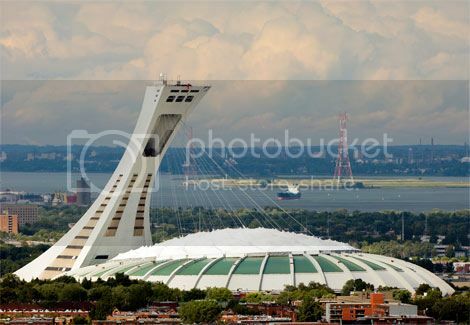 Montreal Olympic Stadium is another icon in Canada that you must visit not only because it hosted the opening/ closing ceremony for the 1976 summer Olympics, but also because the stadium is one of the most interesting architectural buildings you’ll come across in Canada. The Olympic Stadium tower is now an observatory, which offers wonderful views of Montreal, while the Biodome is a lovely zoological park. By the way, you’ll also be able to take a guided tour of the Olympic Stadium and the Olympic pools. Last but not least, it’s Pier 21 in Nova Scotia. 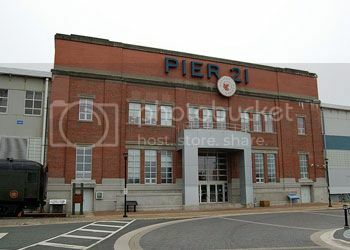 Most tourists seem to forget mentioning Pier 21 when talking about places they have visited in Canada but if you’re looking to visit all the famous Canadian landmarks, you have to include Pier 21 in your itinerary. Pier 21 has changed names to National Museum of Canada, which may be more of a meaningful name for tourists, but since locals still call it Pier 21 I am too! From a historic perspective, Pier 21 is a dream place to visit for history buffs because it was the main hub for immigrants to arrive into Canada. It also houses hundreds of documented records and stories of immigrants who were escaping the horrors of World War II, which you are compelled to read. Who knows, you might even be able to trace information on family members who were part of the ships that arrived in Pier 21?